We have harvested peas 4 or 5 times already. I like to micromanage the garden—pulling every weed and making sure each plant is perfectly placed in its individual plot. So I left the garden at just the right time on my adventures to Australia and CT/NJ. Early spring is the time for inaction: seed and seedlings are in the ground; nature is providing regular watering; the sun is abundant; and the fruit is not yet enticing to garden pests. I know a lot of gardeners might disagree with this. In many places, spring is time to till the ground, weed beds, plant seedlings and prepare for the summer growing season. For us, that happened in November, December and January. Our beets and carrots are growing nicely, even in our lovely clay. The peas have exploded; this was our early January planting (or December?). 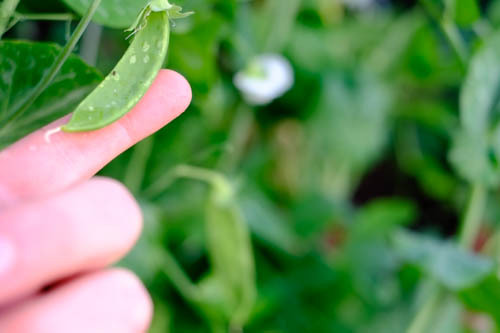 The trellis is less than expertly constructed but these huge peas are a blast to harvest. This basil plant is a start from our new farm and garden store, Pollinate. It has five brothers and sisters hiding throughout the yard, some of which are quite happy. The cabbages have made friends with the local cabbage butterfly and slug population, as have our lettuces. We're trying beer traps for the latter. We've harvested about 7 strawberries so far this year! I'm looking forward to letting this strawberry patch run wild. I've interplanted bush beans recently, and I'm waiting on the arrival of some borage seeds to go in with these. A blueberry fell off recently; definitely not ripe, but definitely a blueberry. Can't wait! 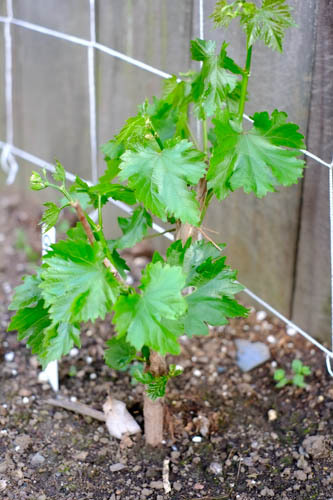 The grapes are growing nicely. I've also planted sunflowers in this area to help extend our fence and draw in the birds and the bees. This is my first time growing corn. The women at Pollinate helped me pick out the right type of corn to grow: a hybrid that will hopefully make wind pollination more successful. I've interplanted squash, cucumbers and pole beans, although they have yet to germinate. We harvested the last of the reachable orange crop this weekend. The tree needs a severe prune, but I don't want to disturb the flowers. Maybe next year we'll harvest earlier, before spring growth. We've installed raised beds in the garden. The plants seem to be happy. Our spring mix is exploding and the radish harvest has been regular and tasty. A few other treats growing in the raised beds: tomatoes, kale, broccoli, eggplants, peppers, green onions, basil, lettuce and more! Our stone fruit tree is heavy with fruits. I've removed a lot of the fruit so the tree can focus on establishing itself and strengthening its limbs instead. Still, couldn't resist a few apricots, nectarines and plums. The awkward contraption on the right, above, is all set to house pole beans, melons and cucumbers; just waiting to put the seeds in the ground. There's one little pole bean that survived the transition to the ground. The raspberry bush is thriving; harvest has begun. Peas, properly planted. These plants are short and mighty. They are just dripping with sweet, tender peas. I do wonder, had I planted them slightly farther apart, if they might have grown taller. Our happiest little basil plant. I've been pruning this guy to encourage bushy growth; it appears to be working. I'm hoping for oodles of basil and homemade pesto this summer. A young fig tree. Who knows what this tree has in store. For now, it's about a foot tall. Lemon and lime trees, starting to produce fruit again. Our lime tree is much happier with the full sun and wind protection than it was on our balcony last year. Chives, parsley, oregano and bolted spring mix. The chives seem to have attracted every aphid in the yard. In the front yard, we've got some cute little raised beds with mint, chocolate mint and nasturtiums. Spring mix, beets and lettuce. I'm a little bit late with planting our flowers, but I'm hoping to put in some wildflowers as well as alyssum, marigolds and a nice shade bush in the front yard. It's time to start attracting some pollinators and beneficial insects! Looking to the future, I've also got some seeds starting indoors still. Once our radishes, lettuces and peas are harvested, I'm hoping to replace them quickly with summer veggies, like cucumbers, peppers, eggplants and tomatoes. By starting these guys indoors, I'm hoping to get ahead. The ugly pea trellis is actually getting replaced by a planting of summer corn, probably interplanted with more cucurbits (squash/cucumbers) and pole beans.